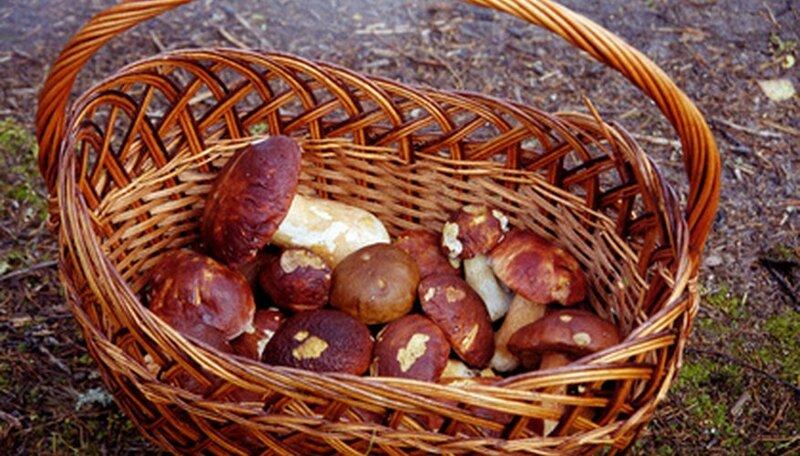 Crimini mushrooms can be more difficult to grow at home than other mushrooms. Unlike most mushrooms, they grow on composted material and are considered a secondary decomposer to other organisms that break down the matter first. Many other mushrooms grow on dying or dead wood, and could be grown on logs at home. Portobello mushrooms are full-grown crimini mushrooms. Once you start your patch of crimini mushrooms, you can let some of them get overgrown to have portobello, as well. Make a mixture of compost that includes corncobs, straw or hay in your compost bin. Spray water lightly over the compost in the bin to moisten the contents. Turn your compost with a broom handle each day. Continue to moisten the compost with water. Check your compost after seven days to see if it holds the water and is pliable. Continue to decompose your compost for another seven days if it is not. Spread the compost in a covered baking dish. Heat it in the oven at 180 degrees Fahrenheit for 30 minutes to pasteurize the mixture. Mix the spawn through the compost mixture in a bin or bucket so that half the mixture is spawn and half is your compost mixture. Mix equal parts limestone and peat. Spread 2 inches of the mixture over the spawn and compost mixture. Place the mixture in an area where the temperature remains about 75 degrees Fahrenheit with high humidity and indirect sunlight to stimulate fruiting. Mist the mixture each day with water. Reduce watering to twice a week when mushrooms begin to appear after 18 to 21 days. Keep the temperature between 59 and 64 degrees Fahrenheit during fruiting. For crimini mushrooms, harvest your mushrooms when they are young. Wait until the mushrooms get larger if you want portobello mushrooms. Your mixture will produce three to five more mushroom flushes.